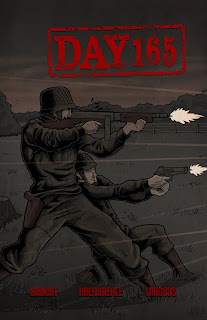 Please take the opportunity to preview the first four pages of Day 165 from Source Point Press. 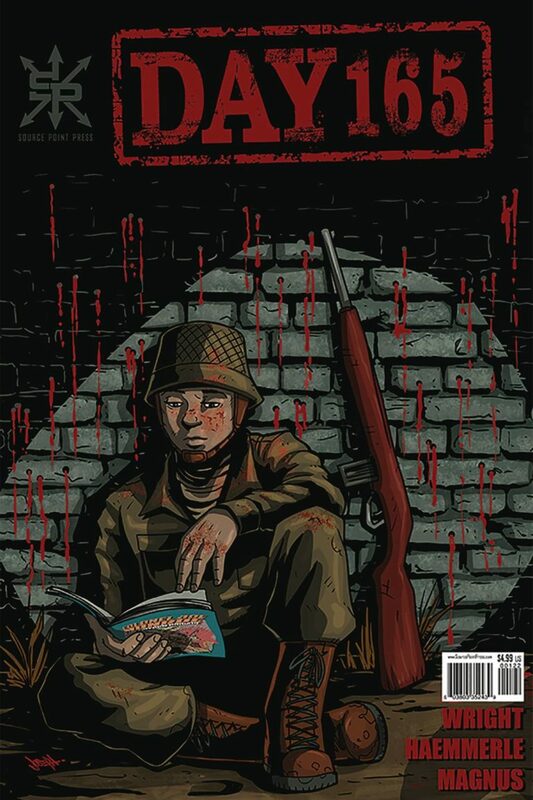 If your local retailer carries Source Point Press comics then grab a copy! 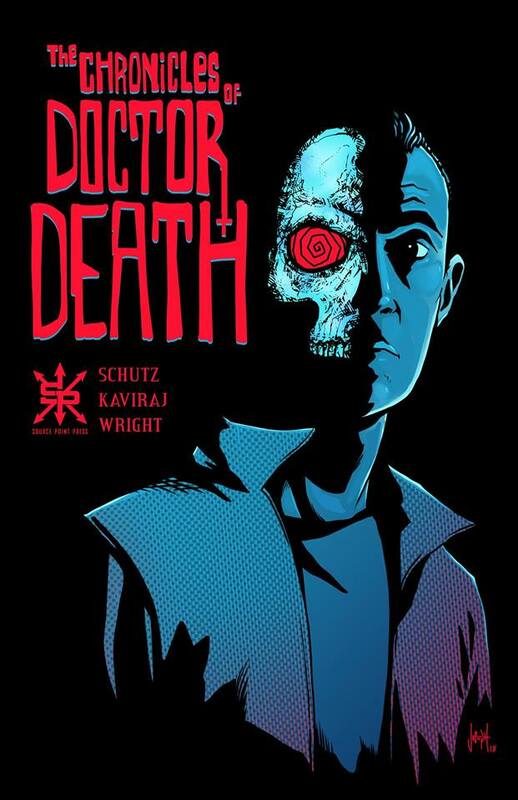 If your local retailer doesn't have Source Point Press in stock then demand they order some of the best indie comics. Day 165 is a war themed comic book series inspired by the Twilight Zone and War Stories where soldiers experience the unexplained during their 165th day of service. 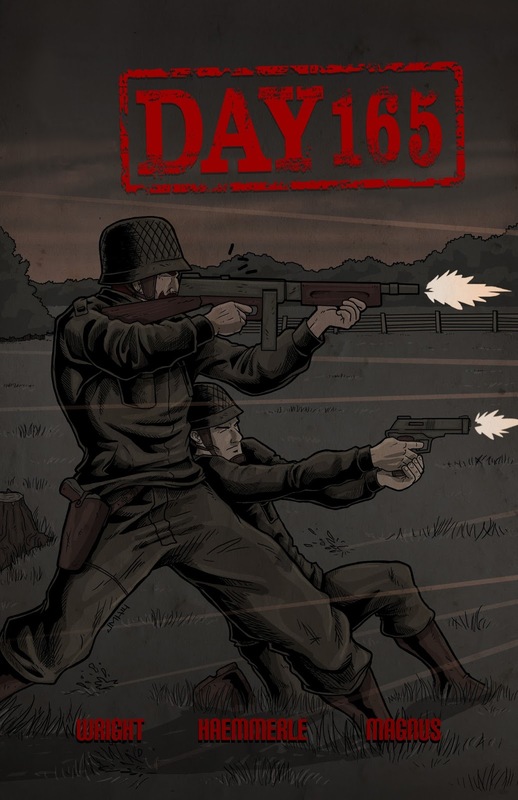 In the upcoming issue of Day 165, a group of British paratroopers will be lost behind enemy lines. Pvt. Donnie Smith is an avid comic book reader and wants to be more like his idol, Colonel Joe Monroe. Smith is under the supervision of Sgt. 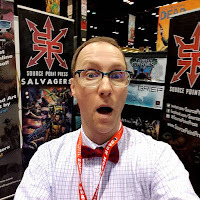 Freddie Hayes, who has nothing but disdain for comics. Both Smith and Hayes will be forced to confront enemies new and old. 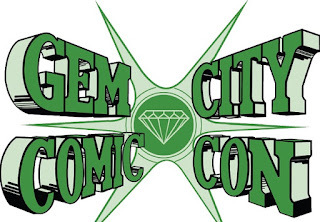 Kav and Tony are two webcomic collaborators and lifelong comic book fans having fun reviewing titles from the Golden and Silver Age of Comics. They know these comic books were published with a young audience in mind, but they couldn't pass up the opportunity to make fun of goofy covers, ridiculous plots, silly dialogue, and pseudo-scientific shenanigans. Kav: Back in the 60's DC did a survey and kids chose gorillas as their favorite cover feature, so they went way overboard on the gorilla covers. They popped up everywhere. Jimmy Olsen and the science fiction titles seem to have taken the brunt of the damage. 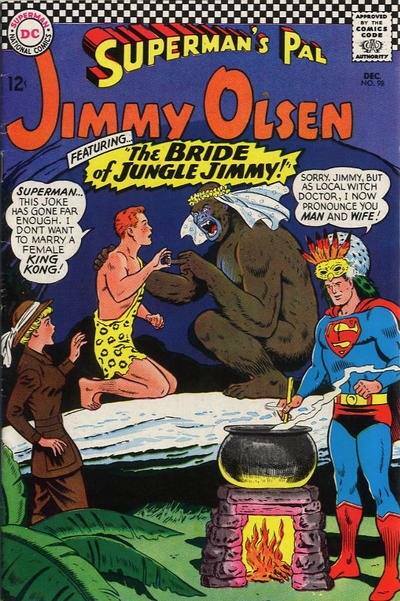 Here we see the inevitable final result of this nonsense-Jimmy being forced to marry a gorilla by a Witch Doctor Superman. Many times where there was a gorilla, a witch doctor wasn't far behind. We see Jimmy's new wife already screaming at him about something. Get used to it buddy. Of course Lucy Lane has to be present whenever Jimmy is humiliated. I read a lot of these Jimmy Olsen stories and Superman is always depicted as the trickster character from Joseph Campbell's Hero's Journey. Kinda helpful but mostly not. In 'Midas of Metropolis' Jimmy had to spend a million dollars to get a million in 24 hours. He was down to his last 10 cents, it was Sunday, and everything was closed. Superman just stood there grinning instead of telling Jimmy to put the dime in the parking meter before he gets a ticket. He got the ticket. I've had friends like this. Don't ask me what Superman is stirring in the pot but it's an appropriate image for sure. Tony: Superman is not only just a witch doctor, but he's the local witch doctor. 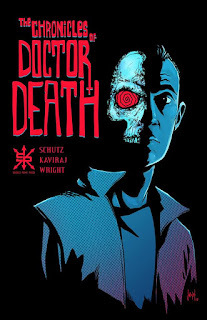 Hopefully, Jimmy's health care plan has witch doctor Superman in his network. Also, I'm not fully convinced that Supes successfully completed an apprenticeship to earn his degree or certificate or whatever in witch doctoring. Dude probably didn't even do a residency. Why does local witch doctor Superman need a fire when he can boil that pot with his heat vision? I can only imagine the absurd plot that unfolds in this issue. 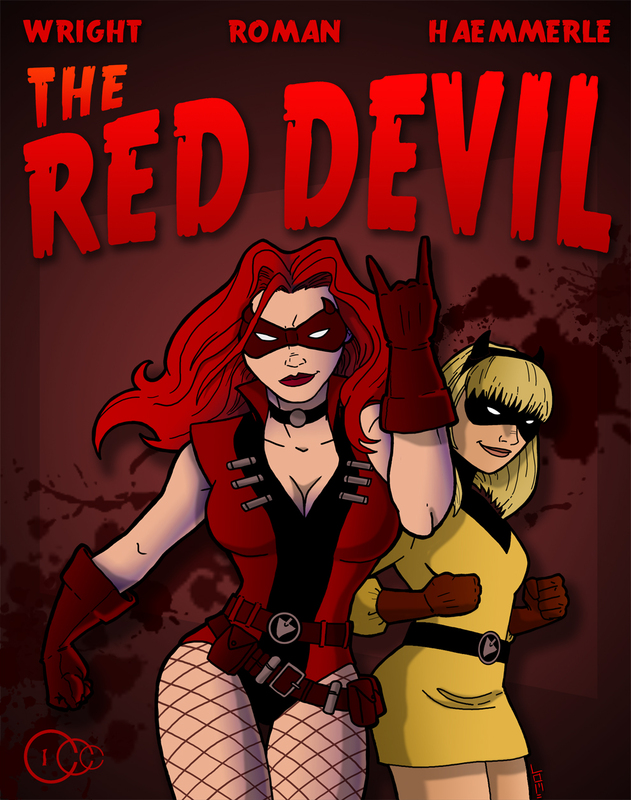 The Day 165 Kickstarter campaign is still underway and please take some time to check out our supernatural war themed comic book which will be published by Source Point Press. 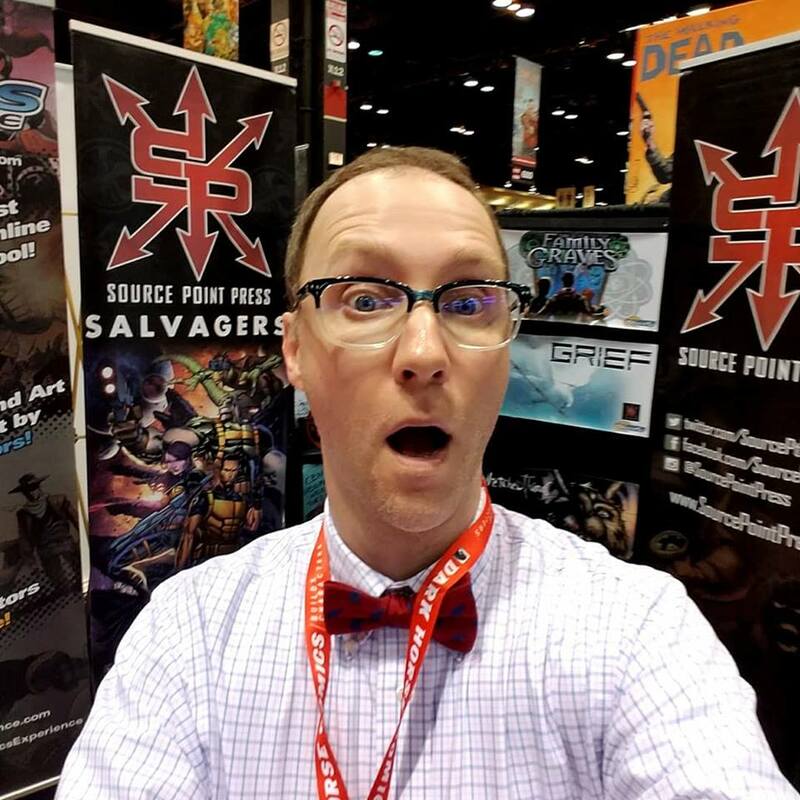 We're doing everything we can to promote our campaign and Tony Wright, the co-creator of Day 165, was interviewed by Jimmy McKnight of the Ninja Starship podcast to talk about the comic and the rewards we have for our backers.